Amber reached out to me last year wondering if I was still available to photograph her wedding on March 17th, and I was overjoyed being able to tell her I was in fact still available. For the record, Amber & Zach's wedding date hits a bit closer to my heart in particular because my husband and I have our anniversary on 3.18.17, so their wedding was exactly one day before our one year anniversary. 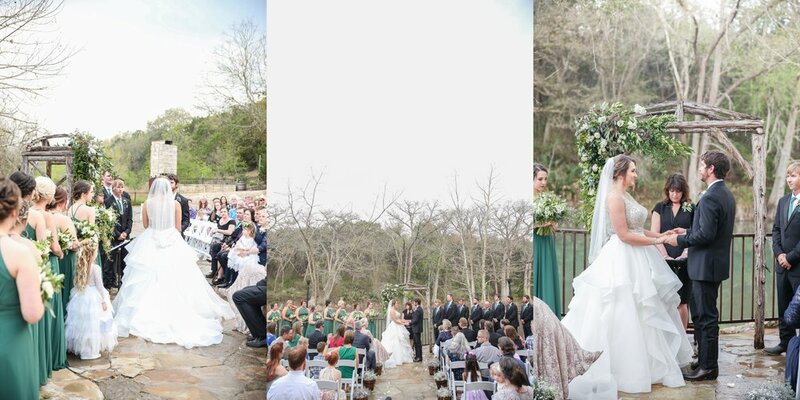 She explained, this particular Saturday landed on St. Patrick's Day, they would have green beer to drink and their wedding ceremony was going to be along the Guadalupe River. As she explained what she had envisioned, with greenery draping the alter, wooden tables for guests and green and ivory as her accent colors, I began to light up. There is something special about hearing about the details that a bride has been dreaming of in her head for several months or sometimes even many years. Every detail was set in place and ready for Amber & Zach to have their ceremony. Then, all of a sudden, out of nowhere, rain starting coming down, hitting the river and soaking all of the chairs that were ready for the couple's guests to be seated. Amber became a bit worried, but after tracking the rain on the Storm app, it showed it was going to pass in a few minutes, so the bridesmaids turned the music up and enjoyed their own dance party together. I sat back & observed as the girls all shared a fun experience together jamming out to a fun playlist together & simultaneously created a memory they will always remember. Just as forecasted, the rain soon passed and dozens of volunteers from the group came to the rescue to dry each row of chairs. There was no stopping this wedding & as soon as the chairs were dried, the guests were escorted to their seats. Just as the ceremony began, the sun broke through the clouds and shined down over the ceremony as if announcing "Don't worry, I am here!". They say rain often brings the sun and I can't help but think about how true this is in marriage. I'm no pro when it comes to the subject of marriage and I've only been married for a little over a year now, but I can reflect on how true it has been in my experience that there is something to be learned from 'weathering the storms' so to speak. As the rain fell down just before their ceremony, it reminded me that even when we have our own 'vision' of how a specific day or event will unfold, life happens. It humbly reminded me that it is in only my control to react positively or negatively to whatever is thrown my way and more often then not, I feel as though difficult times in marriage are often followed up with very fulfilling and joyful times. The weather on this wedding day reminded me of marriage - when the rain comes and you don't feel as close to the person you married, or thought you married, to accept the situation for what is is. After all, my husband is human and I can't expect perfection, just like he cannot expect perfection from me. You see, just like the rain, life randomly gives situations to work through that often times are very difficult to wrap your head around. It is my decision to accept this and if I can positively react and enjoy the very moment I am given to be alive, It is often easier recognize again of the goodness in my husband. It's almost God's reminder for me to not plan so much and to just enjoy each other and the time we have with one another - through rain or shine! This amazing wedding was a testimony to Amber & Zach's love for one another - they will love each other regardless of what they will weather and they'll be strong by doing this together and on the same team! 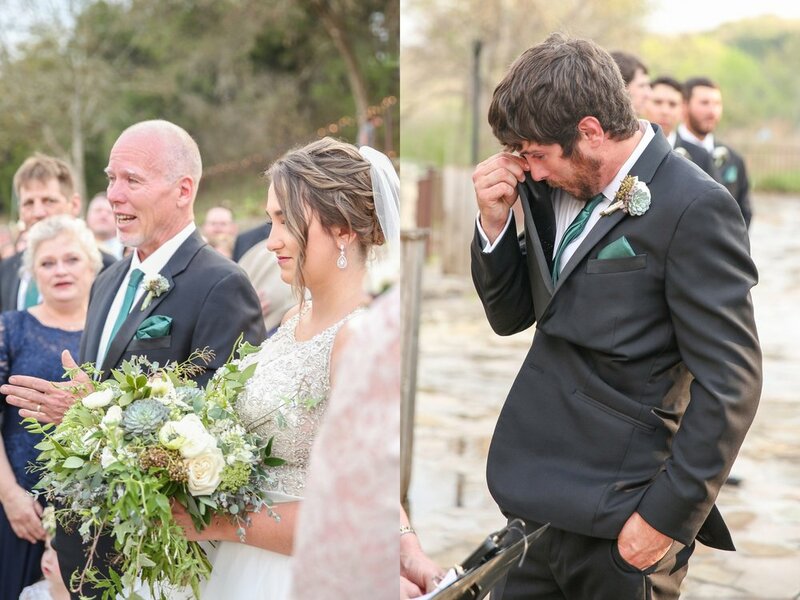 Smelling the flowers, seeing Amber in her gorgeous gown and seeing Zach's eyes swell up with tears as he saw his new bride walk towards him brought such an emotional moment for everyone, including me. As the sun shined down on the couple as they said their vows of commitment to one another, I couldn't help but have a few tears in my eyes as well behind my camera. The scene was absolutely breathtaking as the couple stood next to the calm waters of the river as the sun shined above the ceremony, but the most beautiful part of the entire day was the words they exchanged and the commitment they made to one another that reflected the goodness they each have inside and the love they share between one another. Joy filled the air as the couple sealed the deal with a sweet kiss. It Zach & I consider it such a blessing being able to be your wedding photographers on your big day....and how special we (almost) will share an Anniversary each year! Don't forget that just like your wedding day, the 'rain' will come. Try your best not to fight it, but to embrace the challenges life will throw you and to use that time to grow your 'personal character muscles', specifically of hope and love. I encourage you both to use the difficult circumstances life sends you as a test to make you stronger and to love one another even more during those times - when it's hardest to love. Always keep in mind, rain brings the sun and it had proven very true time and time again in my marriage. Make it your personal goal to focus on the good in one another and uplift each other each and every day. Your words can either uplift or tear down, so be very aware of what you say to one another. Above all, I hope you always speak well of each other in anyone's company, choose each decision as a team and consider first your commitment to one another before reacting to hard times. Learn to say "we will get through this together" and make up your mind to do just that. Don't forget, you can always learn to dance together in the rain! Love develops our character and isn't always a fairy tale, but you can each make the best of any situations by radiating a joyful presence to uplift the other. It was such a blessing to witness in person you both saying your vows to one another and Zach & I were so grateful for you playing our First Dance song as your last song of the night so we could celebrate our One year Anniversary. Cheers to you both as you begin your life together and don't be a stranger.